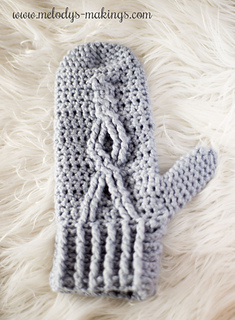 These super classy mittens have a comfy fit and feature a beautiful cabled element on the top. With multiple sizes, this is a pattern you’ll be able to use again and again. The Jennika Infinity Wrap or Scarf Pattern was originally released as my October 2016 Mystery Create-A-Long with over 1700 people participating in the event. 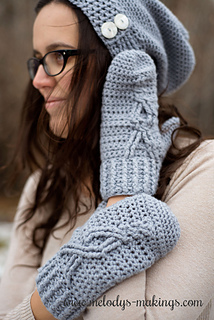 The full Jennika Collection includes the Jennika Infinity Wrap (can be made as an infinity wrap or worn as a straight scarf), the Jennika Slouch Hat, and the Jennika Mitts. You’ll find the Jennika Infinity Wrap Pattern by clicking here. This is an intermediate level pattern, which is worked partially flat and partially in the round. This pattern calls for worsted (4) Weight Yarn and Size 5.5mm (I/9) crochet hook. I am always available to answer any questions you may have. You can contact me at melody@melodys-makings.com. 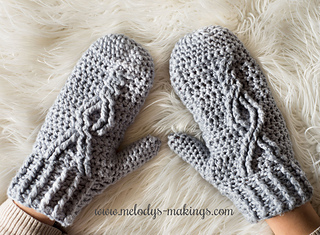 Sign up for the Melody’s Makings’ Newsletter and get 2 free patterns right away! You’ll get regular freebies, fun, and exclusive content.